Review of Bell’s Two Hearted Ale | Beer Apprentice - Craft Beer News, Reviews, Interviews and Info. Today, I’m going to review one of the most talked about, liked and famous of all the India Pale Ales produced….. the Bell’s Two Hearted Ale from the Bell’s Brewery, Inc. in Kalamazoo, Michigan. Let’s not waste any time. Let’s go ahead and get to the description from the website, bellsbeer.com. 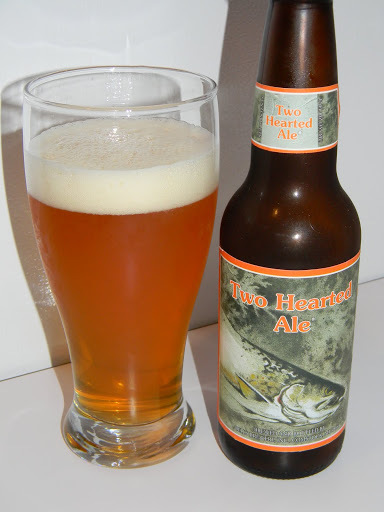 Two Hearted Ale is defined by its intense hop aroma and malt balance. Hopped exclusively with the Centennial hop varietal from the Pacific Northwest, massive additions in the kettle and again in the fermenter lend their characteristic grapefruit and pine resin aromas. A significant malt body balances this hop presence; together with the signature fruity aromas of Bell’s house yeast, this leads to a remarkably drinkable American-style India Pale Ale. Like many of you, I have had the opportunity to sample this brew several times, both on tap and from the bottle. Today, we are pouring from the bottle. The Two Hearted has an ABV of 7.0% and comes packaged in a 12 oz. bottle. The pour produced a hazy, bright orange/yellow color with some brighter yellow highlights around the bottom of the glass. The head was off white, very full and soapy looking. It’s well endowed with tremendous retention and adequate lacing. The nose brought forth strong citric aromas of grapefruit and orange. It came out both a bit floral and piny. A hint or two of a bready/biscuit malt pulls some of the hoppiness down to help create a more harmonious balance. It smells clean and fresh. To me, it’s reminiscent of a homemade orange juice cake or orange juice punch. The taste is very similar to the smell in that it recalls the plentiful grapefruit and orange characteristics. Actually, I found that the orange started to overtake the grapefruit a little bit and really push the flavor along. Nice, sharp “bites” of bitterness tickle the palate on the initial taste, but as the beer wanders across the tongue, the biscuity malt helps to restrain some of the sharpness. Only a trace of alcohol is detected and after a few minutes it was dissolved into oblivion. Overall, nicely balanced and even. The mouthfeel was medium, crisp, snappy and smooth. It was mostly dry at the beginning, however it seemed to become a tad bit watery after it had a chance to warm some. A warming alcohol is felt down the back of the throat, but like the taste, is quickly dismissed after a few sips. It goes down rather easy, I must say. I can definitely see why people enjoy this beer so much. It’s both very good and very easily drinkable. I really liked how the orange juice was a bit more dominant than the grapefruit in the taste. It seemed to change things up a bit. This beer is most surely one to try if you have not had it. It’s good year round, but especially fitting during the Spring and Summer. Compared to a lot of the “Imperials” and “Doubles” out there right now, this beer falls just a bit short, but it still holds its own, is well balanced and should not be taken lightly. Thanks to everyone who reads and comments. It’s most appreciated. I really enjoy the interaction.